This Summer school will allow each participating artist or designer to develop strategies in advancing their studio practice. Work will be developed individually. There will be emphasis in building a community invested in sharing and discussing ideas. 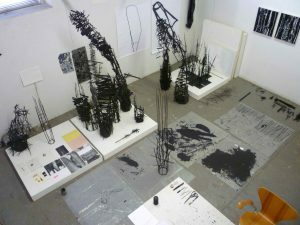 Course objectives; making, group critiques, visual research, developing conceptual enquiry, understanding material interests and appropriateness to practice, presentation and installation ideas, influences, addressing goals and ambitions, professional practice, current thinking in art and design, and what makes a practice relevant and contemporary. Raised in Glasgow, Fraser Taylor is an interdisciplinary visual artist who lives and works in Chicago. After receiving his Bachelor of Arts in printed textiles from Glasgow School of Art, Taylor continued his studies at the Royal College of Art in London where he earned a Master of Arts. In 1983, upon completion of his studies, Taylor co- founded The Cloth, a creative studio focused on exploring fine art and design practices with particular application to contemporary textile design and production. Works from The Cloth are part of the permanent collections of the Victoria and Albert Museum in London and the Art Institute of Chicago. The Cloth disbanded in 1988.